Corresponding member of the International Informatization Academy (IIA). During working in Granit HPTF I had three made out and introduced rationalization. 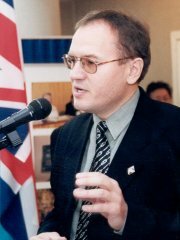 As the expert in computer and telecommunication technologies in 1994-95 I was published repeatedly in the QWERTY Journal (Moscow) and COMPinform Newspaper (Almaty). 1998-2002 publications: in specialized journals - Internet World (St.Peterburg), Computer Club, Com&Com.Kz, Internet & Me, and Adam, in newspapers - KP-Kazakhstan, KIT, Vecherniy Almaty, and Ogni Alatau (all - Almaty). Since December 1996 I managed Web projects in Internet. The founder of Web portal Site.KZ (All WWW Kazakhstan) - the most popular site of the Kazakhstan Internet. Leaded "5 minutes about Internet" in the SUPERDOM weekly program on the RAKHAT telechannel. The member of jury of competition Best business site KITEL 2000-01. The participant of 5th Russian Internet Forum (Moscow, March 2001) and international conference STARWEST 2001 (San Jose, USA, October 2001). Besides native Russian, in a different degree I possess the following languages: English (rather freely I understand the technical texts, I speek poorly), German (I read and translate with the dictionary, I speak very bad), Byelorussian and Ukrainian (freely I read and understand dialoges), Kazakh (I understand at the elementary household level). Freely I possess the personal computer as at a level of the single user, and at a level of the LAN`s user. Has run in a large number of the various specialized softwares. I take a great interest in sports (chess, volleyball, football, basketball, table and lown tennis) and sports statistics, rock music, poetry.